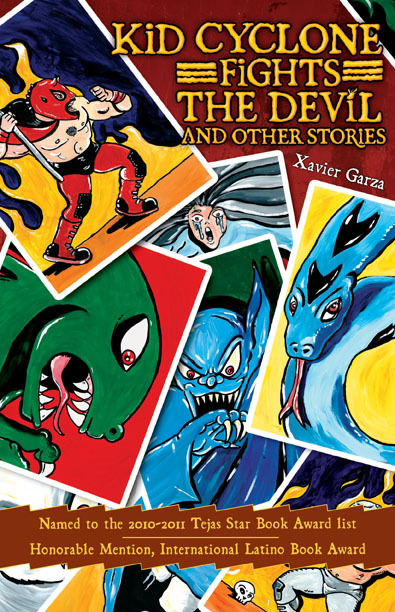 Born and raised in the Rio Grande Valley, XAVIER GARZA is a prolific author, artist and storyteller whose work focuses primarily on his experiences growing up in the small border town of Rio Grande City. He graduated from the University of Texas – Pan American in 1994 with a BFA in Art and has exhibited his art and performed his stories in venues throughout the United States. His work includes Charro Claus and the Tejas Kid (Cinco Puntos Press, 2008), Juan and the Chupacabras / Juan y el Chupacabras (Piñata Books, 2006), Lucha Libre: The Man in the Silver Mask: A Bilinguel Cuento (Cinco Puntos Press, 2005) and Creepy Creatures and Other Cucuys (Piñata Books, 2004). Xavier Garza lives with his family in San Antonio.